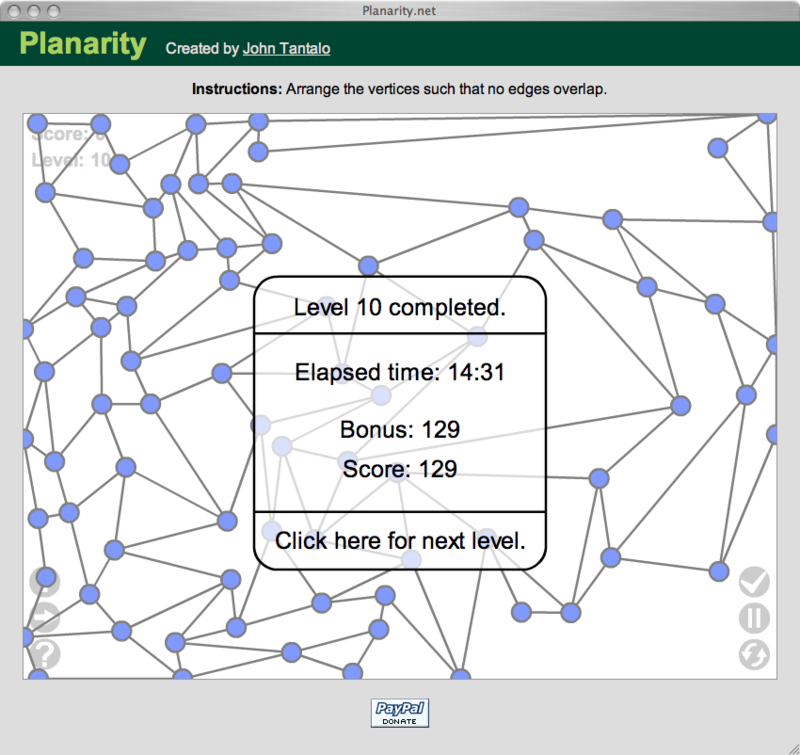 Who knew that Planer Graphs could be so much fun? 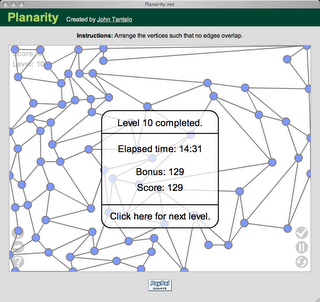 I just stumbled across a game called Planarity where you start with a tightly laid out Planer Graph and move the edges so they don't cross one another. It starts out with small graphs and quickly increases the number of edges. The FAQ said if you could beat Level 10, you'd be in select company. Guess what? Ahh, smell that? Rarefied air, friends. Also, I think my final result puts me firmly in the 'messy thinker' camp. I don't think that if I just started with Level 10 that I would have solved it. All of the tricks and intuitions you build up through the previous 9 levels aid greatly in figuring out the more difficult levels. Such as, looking for vertices that are obviously out of place and should be grouped with their neighbors or that moving lesser connected vertices (2 or 3) to the edges will give you more space to work with. I found levels 9 and 10 a cakewalk because level 8 took me almost a half-hour. Waiting for a furniture delivery, I had plenty of time.